Looking to break out of a food rut? You might try an unusual recipe or an unfamiliar dish at a terrific restaurant. Or you could just pick up a new specialty cheese. No matter what kinds of flavors appeal to you—rich and smoky, mild and herbal, intensely nutty or buttery sweet—you’ll find a specialty cheese to strike your fancy. It’s an easy way to experiment with different tastes. A specialty cheese is one that is of high quality and limited quantity. It may have an exotic origin or a particular processing technique or design. Specialty cheeses are made all over the world. Famous varieties come from Mexico, Sicily, the Middle East, Germany, Normandy, Holland and Switzerland. Bruder Basil is a mild and smoky variety from Germany, for example, while fruity Fribourgeois—a popular table and fondue specialty cheese—is from the Alps. Many areas in the United States produce specialty cheeses, too. In fact, nearly every region in the U.S. has its own artisanal cheese makers who create delicious specialty cheese. It's the fastest growing cheese category in Wisconsin, the nation's cheese leader. In 2013, Wisconsin produced 640 million pounds of specialty cheese, which accounted for 22 percent of the state's total cheese production and 46 percent of the total U.S. specialty cheese production. Specialty cheeses range from soft to hard, white to yellow/orange. Some are made from cow's milk, others from sheep or goat's milk. There are even specialty cheeses made from combinations of milk. Many specialty cheeses have unusual ingredients added. Swiss Alp is a traditional Swiss cheese with a coating of herbs, for example. Anejo Enchilado—as you might guess from the name—is a Mexican cheese rolled in paprika. There are specialty varieties of many common cheeses, such as Asiago, blue, brie, Camembert, Edam, feta, Gorgonzola, Gouda, Gruyere and provolone. Keep an eye on your co-op's cheese cooler and you'll see that myriad specialty cheeses are being developed all the time. Use specialty cheese to make any dish, well, special. Elevate an everyday grilled cheese or macaroni and cheese casserole, for example, or use it in salads and to top baked potatoes, burgers and pizza. 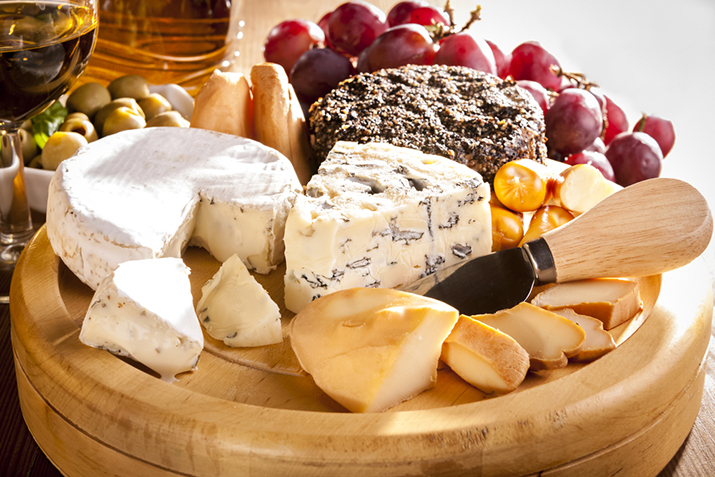 As appetizers, specialty cheeses set the stage for a celebratory meal. Serve them with dried fruits, fall fruits and olives. Partner them with jam; learn more about this in our article Pump Up the Jam (and Cheese). Pick up a bottle of wine and some artisanal bread or crackers, too. Enjoy solo or invite some friends and call it a party! Why not create a regional cheese plate to serve with local craft beers or wines and seasonal fruits and veggies? Ask your co-op staff about their favorite local specialty cheeses. Learn about Creating the Perfect Cheese Plate and get inspired by these Four Deliciously Themed Cheese Trays. Specialty cheeses make a delectable dessert, too. Read more about Dessert Cheeses. Most cheeses will keep nicely in cheese or waxed or parchment paper in the refrigerator. To maximize storage time, it's a good idea to replace the wrap every couple of days. Learn more about Cheese Storage.